The Post2Post bus has just pulled in! 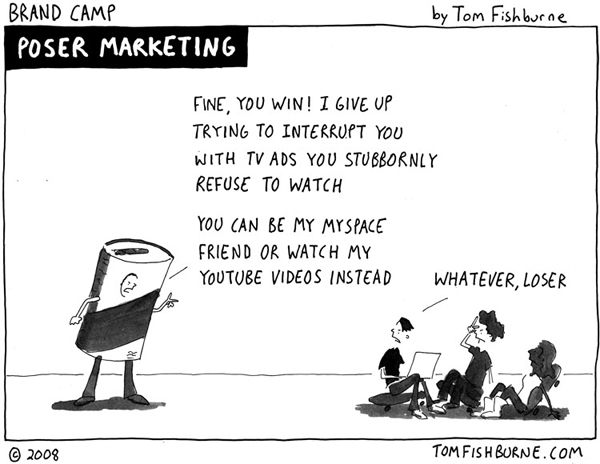 The Fresh Peel is pleased to welcome Tom Fishburne, author and cartoonist of This One Time at Brand Camp, which is the featured book for August’s stop on the Post2Post Virtual Book Tour. I’ve hosted some excellent authors in past Post2Post series, but interviewing Tom adds a whole new level of excitement for me. I’ve been a fan of his cartoons for a number of years and I’m routinely amazed at how with a simple cartoon, he can take issues that baffle brand managers and marketers and portray them with such clarity. Tom brings a wide range of brand experience to the table. Not only is he the genius behind the popular Brand Camp cartoon series, but currently mans the helm at method as Senior Marketing Director of Europe and he previously managed marketing and new product development for Haagen-Dazs, Green Giant, Yoplait, and Cheerios while at Nestle and General Mills. In this interview with Tom, we touch on everything from his time back in Harvard Business School, when he would draw cartoons during class, to exploring complex brand issues such as niche markets, social media and the fight between global and local pulls. And to mix things up, I welcomed him to toss in any cartoons from over the years that he thought related to the topics at hand. Enjoy! 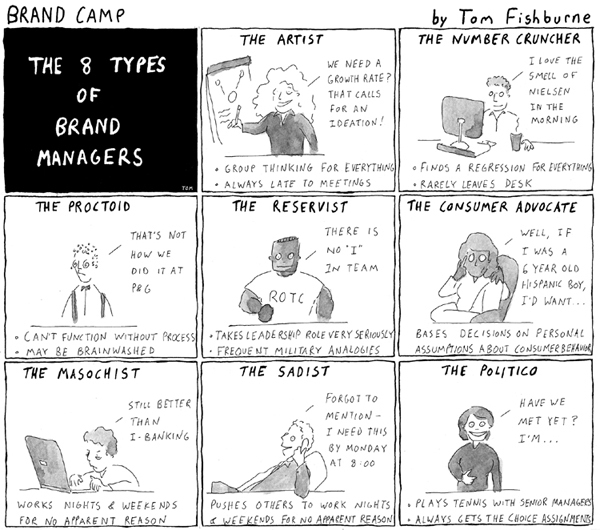 Q: What got you into cartooning and specifically cartoons targeting brand managers? Tom: I first started drawing cartoons at Harvard Business School (not the typical career path for a cartoonist, I know). I was struck that all 800 students in my class shared the same inside jokes, so I started a weekly cartoon called Sky Deck in the school paper. Sky Deck was our nickname for the back row in the class, where all of the pranksters and goofballs sat. When I graduated, I found myself in another environment where everyone shared the same inside jokes – this time, the big American food company, General Mills. I knew that Scott Adams started Dilbert by posting his cartoons to his cubicle at PacBell, so I created Brand Camp, emailed them to my friends there, and tacked them up to the outside of my cubicle. They started to get forwarded around to other companies and now reach about 10,000 people a week, not just brand managers, but anyone who likes to make fun of brand managers (agencies, financial managers, operations guys – wow, just about everyone in the company). Q: Why the title This One Time at Brand Camp? 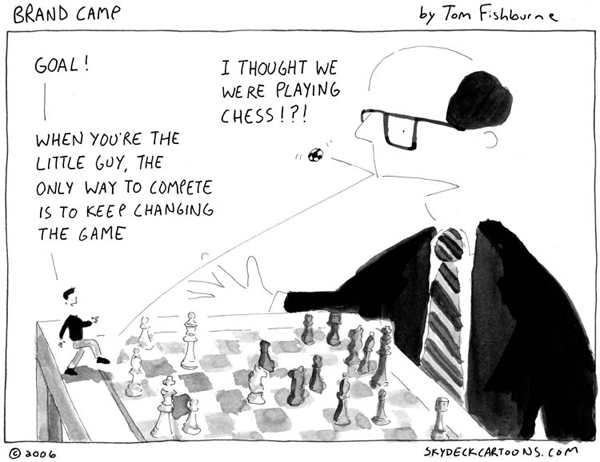 Tom: Well, the Brand Camp name came from the movie, American Pie, where the geeky band student Michelle starts off every story with “This One Time, at Band Camp…” I wanted my cartoon to poke fun at a day in the life of working with brands. It feels sometimes like we all go to camp together. People who work with brands share inside jokes and stories that others often don’t really get (I know my wife rolls her eyes on occasion when I get going on a branding-related story). 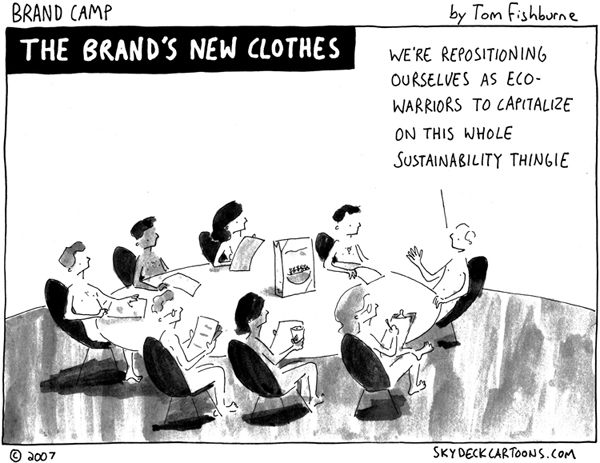 A reader told me they always forward my cartoons to friends with the subject line, “This One Time, at Brand Camp”, and it made me think it would be a good name for my second book. I published my first collection, “Brand Camp”, in 2004. Q: In your intro you say, “everything I need to know about marketing, I learned by drawing cartoons.” How true is this statement? It made me think about some of the marketing lessons I picked up along the way of drawing a cartoon. Obviously, I learned quite a lot about marketing at places like General Mills and Nestle, but I wanted to share some of the simple extra-curricular lessons I picked up at the drafting table, not from traditional brand management. Q: What are some things that drawing cartoons has taught you? But, by trying to appeal to everyone, many mainstream brands aren’t that appealing to anyone in particular. Mainstream brands are losing relevance and there’s increasing opportunity to reach very vocal niche audiences. 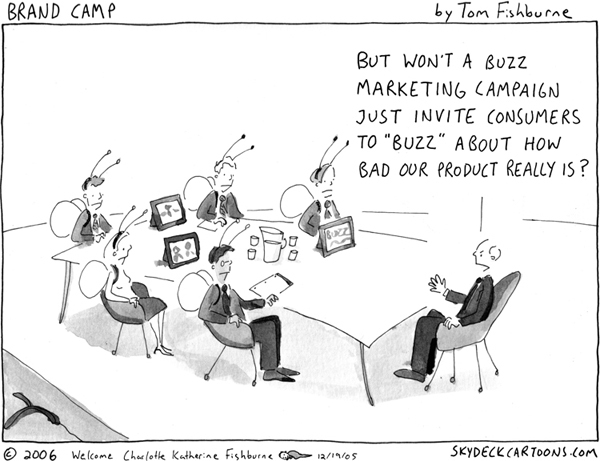 I think this is why a cartoon targeted to the improbable audience of brand managers kind of works. Chris Anderson writes all about this effect in a book called “The Long Tail”. The Internet allows my very niche sense of humor to reach pockets of niche readers all over the world. Another big lesson is to always keep a sketchpad handy. My cartoon ideas come at unpredictable times (on a run, in the shower, in the middle of meeting when I’m supposed to be paying attention to something else). I’ve given up trying to contain them and instead doodle when the inspiration strikes (although usually after the shower). I think business ideas work the same way. Yet, in a business, we typically try to shoehorn idea generation into a tidy box (like scheduling a half-hour ideation before a forecasting meeting or cramming new product brainstorming into a few weeks a year). The result is that the best ideas get lost in the ether in big companies. In our office, we installed a floor-to-ceiling magnetic whiteboard we call the “wiki wall”, where everyone in the company can jot down ideas, at all times. Ideas continually build on each other and it becomes the foundation of our new product development. Q: You have experience working with brands in companies structurally small, large and behemoth sized. When it comes to managing a brand, is a company’s size an asset, liability or both? Tom: I’ve come to feel that it’s more about the mindset than the size. Working in a small company forces you to be David against Goliath. You have to be innovative at every opportunity. You have to turn every consumer touch point into a potential marketing opportunity. And you are forced to continually challenge the prevailing rules of the category. It’s a great discipline to learn, and I think that small companies inherently teach you how to do that. But I think you can apply that challenger brand mentality to big companies too. There’s just as much opportunity to become David within Goliath as there is to be David against Goliath. 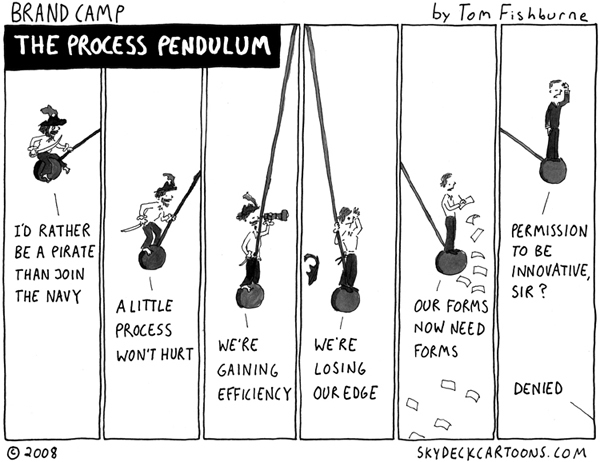 Large companies have staggering resources, but can often feel complacent, bureaucratic and slow. But, there is always room for rule breakers within big companies. I love the fact that an irreverent, cheeky brand like Axe/Lynx came out of a company as massive as Unilever. Adam Morgan wrote a great book on this challenger brand mindset called “The Pirate Inside”. He starts with the classic Steve Jobs’ quote, “it’s more fun to be a pirate than to join the navy,” and then gives advice how to create a Pirate culture inside companies, large and small. Q: With the rise of social media and the age of conversation, what new opportunities do you see for brands? What are some potential pitfalls? Tom: The rise of social media means that good ideas are being shared and that people who really dig your brand can do a whole lot of telling on your behalf. It levels the playing field, because it’s no longer just the brands with budgets for 30-second TV spots that get their message out there. In fact, the traditional 30-second spots are rapidly losing relevance, so it’s a major opportunity for brands. But the risk is what Seth Godin writes about in “Meatball Sundae” on the “new marketing” bandwagon. There’s a rush of companies leaping into myspace, youtube, and blogging in exactly the same self-serving way they approach TV advertising or an FSI insertion – by trying to “interrupt” consumers from what they were doing. This obviously misses the point. Consumers are gravitating to “new marketing” channels exactly because they are in control, not the brands. Q: As the branding landscape continues to change, many brands are struggling to grow globally but still be able to connect with consumers locally. How can brands be both global and local? Tom: Great question (note to self: this would make a good cartoon). I’ve actually learned a lot on this topic in the last two years in my day job, where I’ve helped launch an American brand called method in the UK. We’re not there yet, but we’ve learned the goal is to have a core brand identity that is truly global, but local flexibility to not only “translate”, but “transcreate” (a funny expression I heard along the way). Part of this is making sure that your core identity is truly global. We found that ours mostly was, but there were some bits that were very US-centric. Some were OK (we weren’t trying to hide that we were from California just as Ben & Jerry’s wouldn’t hide they were from Vermont). But some were not (more specific than general points on our sustainability communication). So, it meant evolving our core identity (which actually put us in a stronger position in the US too). The other part was figuring out the right amount of local flexibility. We created an international marketing toolkit so that product and creative communication is largely global. But, then we’re really creative on the ground with how to do it. In the US, we had started to do pop-up shops in different cities (a month-long store rental where we could tell the whole brand story in a 3-D space). We didn’t have the budget in the UK and retail space is even more of a premium in London, so we found a large consumer show called the Ideal Home Show where we built a method home that let us do much the same thing on a small scale. Everyone on the stand spoke with a British accent of course, but it was essentially the same story told in the American pop-up shops. Q: Your cartoons in many ways tend to reflect the most current issues, thoughts and concerns of brand managers around the world. What are some of the most popular topics you see on the horizon? Might we see these topics in future cartoons? Tom: I’ve certainly started giving a lot of attention to the economy and the impact that will have on consumers, particularly with ethical brands that cost a premium. I think that shift is fascinating to watch. For so long, consumers have been “trading up”, and it will be interesting to see how the economy affects that over time. I will certainly continue covering sustainability, particularly as companies struggle to find their voice. 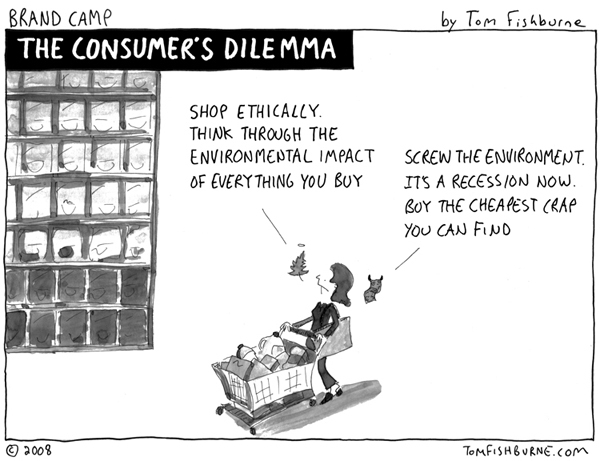 There has been so much greenwashing and I think consumers are starting to feel a serious green fatigue. But, perhaps most of all, I sense a major shift in marketing from the snake oil salesmen of our past to an optimistic future where marketers are simply nice people who make good products in a transparent way. I see a lot of cartoon fodder on that journey. My cartoons are kind of like a diary, so they typically reflect exactly the issues I see. Any topics are fair game (particularly if they make me chuckle), and I’ll continue to stumble along just like the characters in my cartoons (and laugh at all of our mistakes along the way). I’ve been a fan of Tom’s for many years now. He’s got a great illustrative style… and his genius is his ability to turn a *real* day-in-the-life into a single panel strip that hits the situation dead-center-on! I’m a big fan of Tom’s work, and now hearing just how smart he is and the depth of thought that goes into his ideas makes me a big fan of Tom himself. Thanks for stopping by. And you’re right, Tom sure does show his smarts with his answers here.